Maintenance services for solar heating equipment. 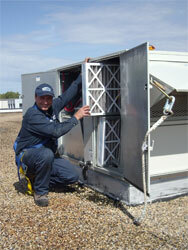 With any mechanical equipment, regular maintenance saves you time and money. Scheduled maintenance provides savings through efficient use of equipment, reliability of equipment, and extended life of equipment. LOWE's preventive maintenance and inspection program is unique. LOWE will provide you with a detailed list of your equipment, a customized maintenance planner, and an inspection report. You will have the opportunity to review this information with your project manager and discuss any service that may be required.